Boat sport and travel show fun! 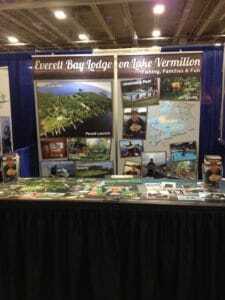 The Chicagoland Sport Travel and Outdoor show wrapped up Sunday. We had a blast catching up with many guests set to return this season. It was also great to meet many new Chicago area anglers, eager to make the trip north to Lake Vermilion. Spring can’t get here soon enough. We’re looking forward to seeing all of you when this cold weather makes way for our 20th season on Lake Vermilion. We got pretty distracted in a conversation with the Fitz crew about the picture selection in the new brochure. So much so that we failed to give Bill a chance to see that a couple of his photos DID indeed get in the show photo book. Keep all those great pictures coming! June 1 – 8, Cabin 5 & the Alumacraft Escape have been freed up by too many school snow days. July 13 – 20, Cabin 10 & the Alumacraft Escape have been freed up to make room for the addition of more guests to the trip. These are prime weeks and now is your chance to book one of these spots. Stay warm and sharpen those hooks!